Last month, I shared with you the household herbal remedies I used to treat my daughter’s first canker sore. One of the natural items my herbalist friend recommended was licorice root, specifically glycyrrhiza extract, which I did not have on hand. Now, I have discovered a canker sore product made from glycyrrhiza extract that is all natural: CankerMelts. 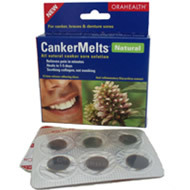 CankerMelts not only heal canker sores in 1 to 5 days, but they help relieve the pain too. These slow natural dissolving discs adhere to the oral sore and provide anti-inflammatory pain relief. Recently, my daughter thought she had another canker sore, although I could not confirm it by peering in her mouth. I let her try CankerMelts, and she did not complain about the sore again. CankerMelts are not limited to canker sores, as they can be used on any sore in the mouth, such as from braces or biting one’s cheek. It is advised not to use CankerMelts with children under six years of age, due to choking hazards. CankerMelts are made in the USA. There have been several clinical studies on CankerMelts proving its effectiveness. I almost want to get a canker sore to try them out (well, not really). The use of licorice root for medicinal purposes dates back 4000 years to the Egyptians. I really should add it to my herbal medicine chest for when the CankerMelts run out. « Can You Imagine Your Kids Going to School 4 Days a Week? This product is great. There is nothing like it. It’s hard to find locally.